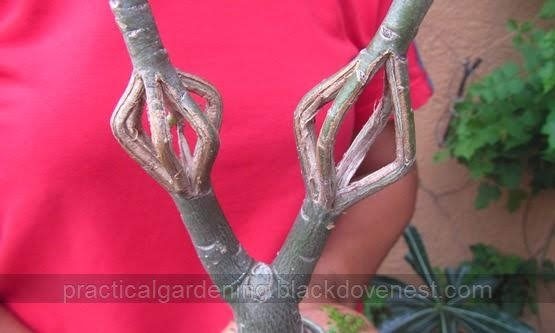 After the tutorial on Adenium flat grafting method, we'll discuss a project on Designer Adenium Stem Sculpture. Just when you thought that braiding the stems of adeniums (desert rose) was cutting-edge in transforming these already beautiful plants into an art form, here comes another. Stems of adeniums are so flexible and versatile for all sorts of bending, cutting and splicing that there's plenty of options for stunning end-results. For this project, we'll create a small cage-like part onto the middle of the adenium stem. There will be six vertical cuts that will transform the single adenium stem into six stem strips. It is a basic design that's easy to create even for beginners. You can make it as big or as long as you want. The Stick Method allows you to work with readily available materials. Adenium Plant (Desert Rose) - The plant should have a stem that is long and thick enough to allow you to create the basic cage. Allow the space for the cage to have at least 3 inches in length. The stem thickness should be at least 3/4 inch. This will be cut later and will be used as spacers to keep the sliced stem strips apart. Thin bamboo skewers for barbecue are good. Pen - Used for marking points on the adenium stem. Sharp Razor Blade - The thin and sharp razor blade will be used for slicing vertical slits on the adenium stem. The half blade is preferable as it is easier to maneuver when cutting than a whole blade. Pruning Shears - For cutting the thin bamboo sticks to correct size. With a pen, mark the topmost point of the cage. Measure around 3 inches down and then mark the bottom point of the cage with the pen. Draw two circumferential line around the stem on the two points. Draw a vertical line from the top point to the bottom point. With a half razor blade, trace the marked line with a shallow slit. With stronger pressure, dig the razor blade into the shallow slit so it cuts through the adenium stem. Notice how the razor blade cuts through the thickness of the adenium stem until it appears at the opposite side. Slide the razor blade downward without going beyond the bottom point that was marked. Reverse the razor blade so its sharp edge faces up. Cut by sliding the razor blade upward without going beyond the top point that was marked. That completes two opposite vertical cuts. With a pen, mark two points on the top mark. The two points are equidistant from the original top points of the vertical cuts as shown below. Do the same on the other side. As in the previous two vertical cuts, draw vertical lines for these points. Insert a thin bamboo stick in between the two vertical cuts as shown below. The bamboo stick will create room so you could work on each strip individually. Cut vertically downward along the vertical lines that were drawn without going beyond the bottom points. Cut vertically upward along the vertical lines that were drawn without going beyond the top point. Altogether, this will create a total of six adenium stem strips from the previous single stem. With a pair of pruning shears, cut a one-inch length from the bamboo stick as shown below. This one-inch bamboo stick will become a spacer to separate the first pair of two opposing stem strips. Cut 2 more of these one-inch bamboo spacer so there will be 3 one-inch long bamboo spacers. Insert the first one-inch spacer and position it horizontally between two opposing stem strips. Ensure that the first one-inch spacer rests in between the two strips with enough compression so the spacer doesn't dislodge. Do the same for the second spacer as shown below. Do the same for the third spacer while carefully avoiding the first two spacers that have been positioned already. With the razor blade, cut off burrs or excess trimmings along the sides of the stem strips. Shown below is the completed cage with the three spacers in place. Here is the adenium plant with the completed cage along the middle of the stem. 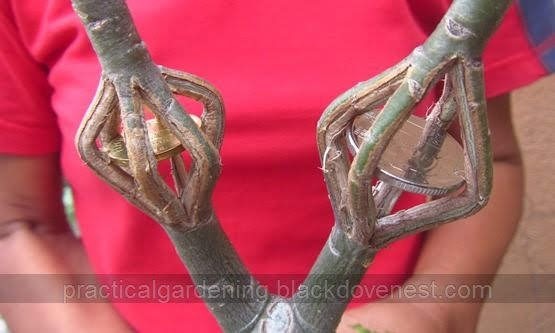 If the adenium plant bends at any point where the cage is located, you may put a stake on the pot and then tie the stem to it to keep the plant vertical or straight. Put the adenium plant in a shady place for the new cuts to dry and heal. Complete healing may vary from 15 to 30 days. When fully healed, the cage will look like the one below. 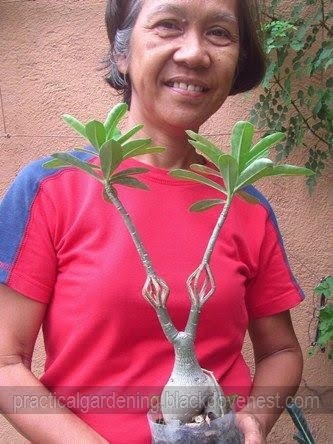 This adenium plant is alive and healthy, with nutrients and water still being drawn from the roots and through the adenium stem strips to its foliage. Notice that some of the parts of the adenium stem strips are either green or brown after drying and healing. You may have two or more stems having the same basic cage design with slight variations. In the photo below, the stem on the left has six strips while the bigger one on the right has four. A fun way of decorating this designer adenium is to place shiny coins horizontally inside the cage as shown below. This will make an attractive good luck charm or simply a nice conversation piece, especially when placed indoors.